Encryption software encrypts and decrypts data in the form of files, removable media, emails messages or packets sent over computer networks. File encryption is a form of disk encryption where individual files/directories are encrypted by the file system itself. The software executes an algorithm that is designed to encrypt data in a way that it cannot be recovered without a key. Encryption is an important part of computer communication and file protection in modern times. Such software are mainly used to protect sensitive data from third parties. The true strength of a protection software doesn’t lie in its strength of encryption rather in the layers of protection that it can provide. 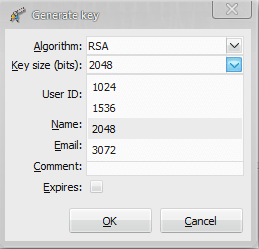 Gpg4win relies on 2048 bit encryption using guidelines for key length and algorithm established by the German Federal Office for Information Security. Either go through the step-by-step wizard if you are a beginner at encryption or directly manage your digital signatures with multiple layers and levels of trust. In fact, what makes this digital encryption software so handy is its ability to alter the key length for improved security. You can randomly assign different lengths making it harder to guess or crack the pass phrases. Once encrypted, it is hard to verify if the file is complete and if all the data has been successfully protected. 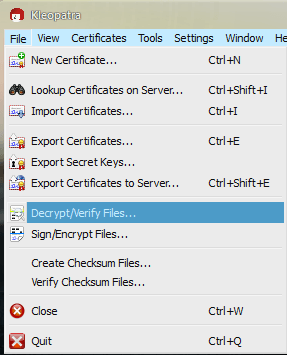 Checksums available with the gpg4win interface provides this opportunity by making unique checksums for all selected files such that their integrity can later be verified without ever decrypting them. This is the all-in-one certificate manager included free with gpg4win that takes care of all certificate management including multiple key servers. 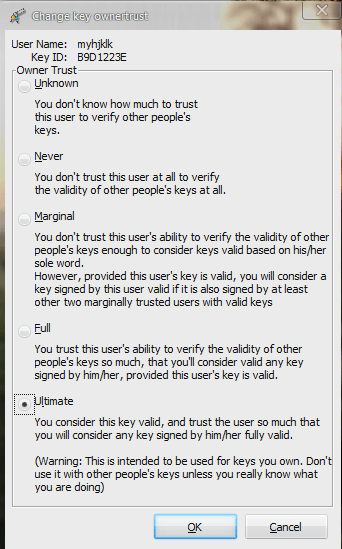 It even allows users to certify openPGP certificates. Gpg4win stresses on better usability or in other words being user friendly. That is why it allows users to backup keys and export them to a secure location so as to never lose any of the keys. Moreover, sharing keys with trusted sources or users is as simple as an encrypted email containing keys for specific files. It even includes clipboard encryption so no one can copy anything from your computer without the proper passphrase. In short, this tiny but intuitive software helps completely secure your computer from unwanted prying eyes. Did we mention that it also allows you to search for certificates on various servers? Available in both English and German languages, gpg4win is a freeware that is light on the resources and heavy on encryption. It may take a little getting used to initially but in the long run provides an immense opportunity to truly safeguard all your private and sensitive data. Be it encryption, digital certificates or the sharing or sensitive emails through password protection, this program can do it all from a single interface. In fact, you can choose which files to encrypt and which not to, sending or sharing them together with other users and only those with the security keys gain access to the entire folder. The possibilities with gpg4win are endless and considering its 2048 bit strength, cracking the encryption is almost impossible.